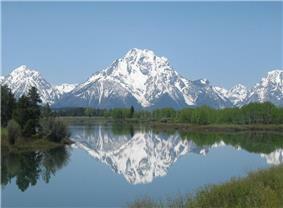 Mount Moran (12,605 feet (3,842 m)) is a mountain in Grand Teton National Park of western Wyoming, USA. The mountain is named for Thomas Moran, an American western frontier landscape artist. Mount Moran dominates the northern section of the Teton Range rising 6,000 feet (1,800 m) above Jackson Lake. Several active glaciers exist on the mountain with Skillet Glacier plainly visible on the monolithic east face. Like the Middle Teton in the same range, Mount Moran's face is marked by a distinctive basalt intrusion known as the Black Dike. 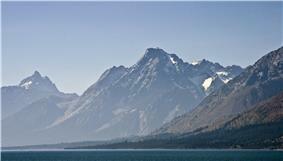 Mount Moran is a massive and impressive mountain which would make it attractive to mountaineers. However, the comparative difficulty of the approach to the climbs makes it a much less popular climb than the Grand Teton and other peaks to the south. No trails to Mount Moran have been maintained for over twenty years, and any approach overland requires a great deal of bushwhacking through vegetation, deadfalls and bogs along the perimeter of Leigh Lake. Instead, most climbers choose to canoe from String Lake, across Leigh Lake and then pick their way to their respective route; but even this may require some overland route finding. As a result, most climbs on Mount Moran tend to take several days even when the technical portion of the climb is comparatively brief. The first ascent of Mount Moran was made on July 22, 1922 by LeGrand Hardy, Bennet McNulty and Ben C. Rich of the Chicago Mountaineering Club via the Skillet Glacier route. The Skillet Glacier still provides perhaps the easiest and most direct route to the summit and is rated 5.4. As the name implies, most of the climb is on the steep snow and ice of Skillet Glacier, and an ice axe and crampons should be used in the ascent. The most popular route up Mount Moran is the CMC route, named for the Chicago Mountaineering Club. The CMC is rated 5.5, and ascends the east face just south of the Black Dike. The CMC climbs good rock and is essentially free of snow and ice. It also has the advantage of a good camp high on the flank of the mountain. The Direct South Buttress route, rated 5.7 A3, is recognized in the historic climbing text Fifty Classic Climbs of North America and considered a classic around the world. On November 21, 1950, a Paul Petzoldt located the wreckage on November 25, but the extreme location of the crash made it impossible to recover the plane or the bodies. The wreckage remains on the mountain today, but the Park Service discourages direct climbs to the site. ^ a b "Mount Moran, Wyoming". Peakbagger.com. Retrieved 2011-05-28. 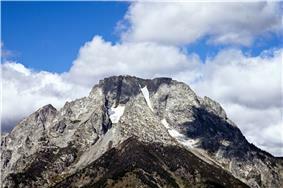 ^ Mount Moran, WY (Map). TopoQwest (United States Geological Survey Maps). Retrieved 2011-05-28. ^ "Hayden Expedition". Wyoming Tales and Trails. Retrieved 10 October 2010. ^ Ortenburger, Leigh N.; Reynold G. Jackson (1996). ^ "Rescuers Failed to Reach Downed New Tribes Plane". Christian History Institute. November 22, 1950. Archived from the original on 2005-06-26. Retrieved 2013-12-25. A climb of Mount Moran trip report with photos and video.